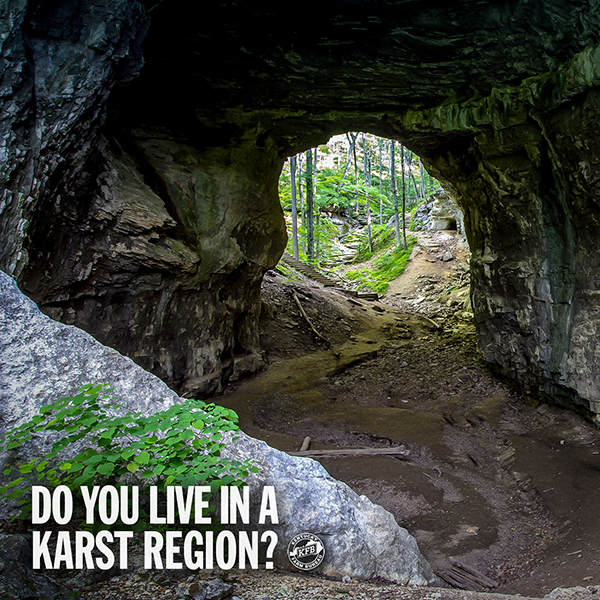 If you’re a Kentuckian, you may have heard the term “karst” a time or two. After all, our state has one of the largest karst landscapes in the world… but what exactly does that mean, and why does that matter? 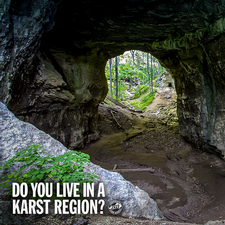 Karst derives from a Slavic word that literally means barren, stony ground. The term describes a landscape as a whole, not a single feature such as a sinkhole or cave, according to the Kentucky Geological Survey (KGS). This terrain often develops atop limestone – and more than 50 percent of Kentucky’s surface rocks are limestone, which explains the state’s abundant karst environment. 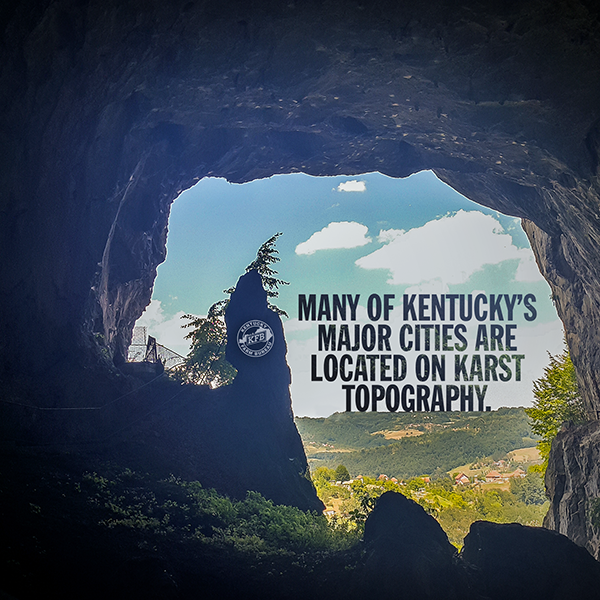 Many of Kentucky’s major cities are located on karst topography, including Bowling Green, Elizabethtown, Fort Knox, Frankfort, Georgetown, Hopkinsville, Lexington, Louisville, Somerset, and Winchester. 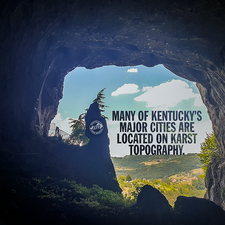 For a generalized map of the karst regions of Kentucky, click here. Some well-known tourist hot spots sitting atop karst include Daniel Boone National Forest, Carter Caves State Park, Mammoth Cave, and the famous rolling hills of the Inner Bluegrass. While karst topography is responsible for many of our states awe-inspiring caves, bountiful springs and streams, and rolling horse farms, it also puts our state at the top of the list for potential sinkhole development. Karst environments are typically characterized by the existence of sinkholes. The KGS cites that sinkholes often form in two ways. The most publicized type is a cover-collapse sinkhole, which occurs when the roof of a cave becomes too thin to support the weight of the bed rock and soil above it and therefore collapses. This terrifying scenario often causes catastrophic damage. However, not all sinkholes are this grandiose. There are also cover-subsidence sinkholes, which slowly develop and form sunken depressions as the ground under them deflates due to dissolving bedrock. Over the years, terrifying tales, including one out of Bowling Green, Ky., have made their way into headlines worldwide. The National Corvette Museum became a worldwide sensation in 2014 when a 30-foot deep sinkhole collapsed inside the museum, swallowing eight prized Corvettes whole. Kentucky’s karst landscape once again made headlines in March 2019 when a giant sinkhole opened up at the Louisville Zoo. Luckily, no people or animals were hurt when the earth caved into a 50-foot deep, 90-yard long depression. 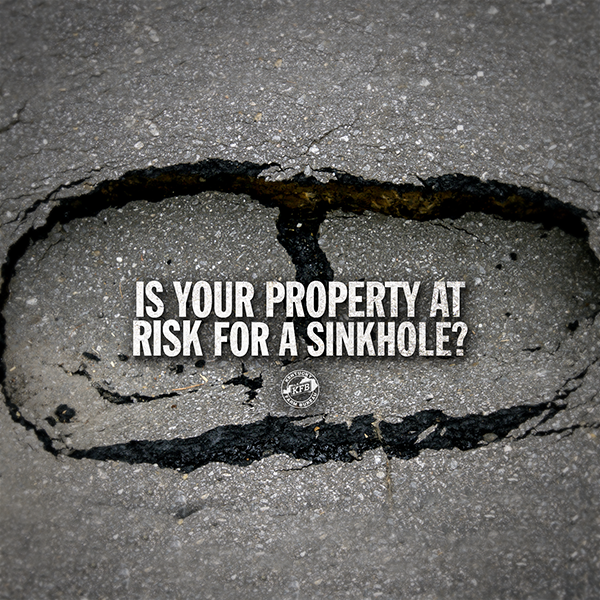 It’s no doubt that Kentuckians’ properties are susceptible to the formation of sinkholes. However, less than 1 percent of Kentucky Farm Bureau members with homeowners insurance choose to purchase an optional sinkhole endorsement. This affordable endorsement, which can be tacked onto an existing or new homeowners, farm owners, or manufactured home policy, helps cover catastrophic loss, including your home’s structure and its contents, due to sinkhole development on your property. 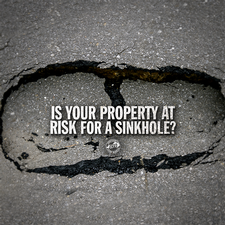 >> Want to learn more about Kentucky Farm Bureau Insurance’s sinkhole coverage? 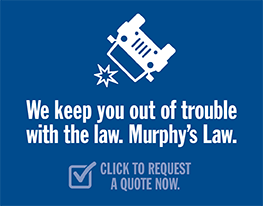 Click here to speak to your hometown agency. Why should you recycle your used tires?